With Russia’s weapons industry booming, state-owned Rosoboronexport received more than double the number of foreign enquiries for arms sales in 2012 than it did in 2011. Rosoboronexport director general Anatoly Isaykin tells journalists about India as its biggest client, Latin America as its priority market, and the continuation of sales to Syria. In 2012, Russia’s military exports hit another record sum of $15 billion. Rosoboronexport accounted for $12.9 billion of this total, the company’s director general, Anatoly Isaykin, told Russian and foreign reporters in late February. In 2011, the figure was $10.7 billion, and in 2010 it was $8.7 billion. Isaykin reported that the structure of military exports had become more balanced. The biggest sales were in aviation equipment — 37 percent. 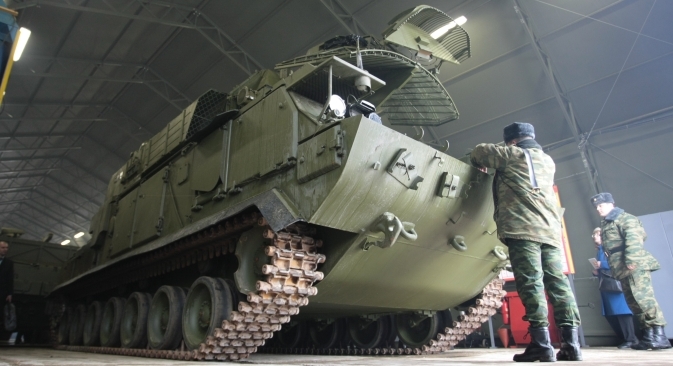 Total exports of land-based weapons and military equipment grew to 27 percent. At the same time, the shares of naval equipment and anti-aircraft systems increased to 18 percent and 15 percent, respectively. The proportions of different types of equipment in the overall structure of Russian exports are thus in line with global trends. Not surprisingly, the portfolio of orders for Russian-made military equipment is also continuing to grow; it currently stands in excess of $37.3 billion. Last year, Rosoboronexport received 1,877 enquiries from foreign clients, and, following consideration of the applications, 1,309 contracts were signed. This is 2.5 times more than in 2011. This growing portfolio means that, in the next few years, Russia can expect to be surpassed by no other country in the world except the United States, in terms of total arms exports. Russian arms were exported to 60 countries last year. The most significant supplies went to countries in Southeast Asia and the Asia-Pacific region — 43 percent. The second most significant market remains the Near and Middle East, together with North Africa — 23 percent. Eighteen percent went to countries in Latin America, while 12 percent to the CIS countries, one percent to countries in sub-Saharan Africa, and three percent to states in Europe and North America. As among the new countries to enquire about the price of Russian arms, Isaykin mentioned Ghana, Italy and Poland. The biggest importer of Russian military equipment was India, which bought 350 T-90S tanks and ordered another 1,500. India is also currently operating 150 modern Su-30MKI multirole fighters. During Russian President Vladimir Putin’s visit to Delhi in December, a contract was signed for another 48 fighters, to be delivered as assembly kits that India will assemble in their own factories. Moreover, Russia is building a fifth-generation aircraft in conjunction with India, as well as the BrahMos supersonic anti-ship missile (planned to fit on the Su-30MKI plane). In addition, the modernization of the aircraft carrier INS Vikramaditya is being modernized by Russia for the Indian Navy. Isaykin noted, however, that there had also been disappointments in India: Russia had lost the bid there to supply multirole fighters, helicopter gunships and heavy-lift helicopters. The head of Rosoboronexport said this setback was due to the fact that the latest aircraft were not yet in service with the Russian Army and had therefore not completed the necessary testing. In reply to a question from Rusia Hoy about the prospects for Russia making advances in the Latin American arms market, Isaykin said: “Promoting our arms to the Latin American market is a priority.” He added that there are especially good prospects in many areas in Brazil, including technology transfer and joint manufacturing between arms businesses from both countries. Indeed, Russia is opening up more and more new markets in Latin America. Nearly 500 Soviet- and Russian-made helicopters are now in use in the region — almost half of these employed by defense and law enforcement agencies. They are mainly from the “Mi” family — the Mi-17 (and variants), Mi-24, Mi-25/Mi-35M medium helicopters and Mi-26 heavy-lift machines. Venezuela is now the second biggest purchaser of Russian arms, after India. The Center for Analysis of the World Arms Trade estimates the value of equipment acquired by Caracas from the Russian defense industry at $4.4 billion. This includes 24 Su-30MK2V fighters, 100,000 AK-103 machine guns, more than 40 Mi-17V-5 multipurpose helicopters, 10 Mi-35M2 attack helicopters, three Mi-26T2 heavy transport helicopters and 5,000 SVD sniper rifles. In a special category of exports to Venezuela are anti-aircraft weapons such as the Tor-M1 missile system, ZU-23-2 anti-aircraft guns, and the Igla-S portable air-defense missile system. There has been a sharp rise in interest in anti-aircraft defense systems around the world, and Russia has a leading position in this segment of the market. Along these lines, Rosoboronexport has orders for the S-400 air-defense missile system up to 2021. Meanwhile, Western reporters have been interested in supplies of air-defense weapons and other arms to Syria, which is in the throes of civil war. Isaykin did not deny that Moscow was continuing to fulfill its contracts with Syria, in so far as they were not under sanctions by the U.N. Security Council. “This military equipment is not of an offensive nature,” Isaykin told journalists. He also stated that Rosoboronexport had not supplied Syria with Iskander missile systems and other offensive weapons (including planes and helicopters), which former U.S. Secretary of State Hillary Clinton had accused Moscow of doing. In addition, Isaykin denied media reports that $1 billion worth of arms and military equipment was due to be supplied to Syria from Russia.